All the way from Lebanon Fadi el Saadi, a world renowned Musician and Percussionist, will be in Knoxville Tennessee for a weekend of music and dance! Get your tickets now for a night you will not want to miss! Fadi El Saadi will be performing LIVE along with a live drummer and Bellydance performances by some of the best dancers around, including Alexia Smith, Claire Metz, TeeJei, Safiya and more! ​For more information on the live show, click here. Alexia Smith and Claire Metz will be teaching a workshop you wouldn't want to miss! 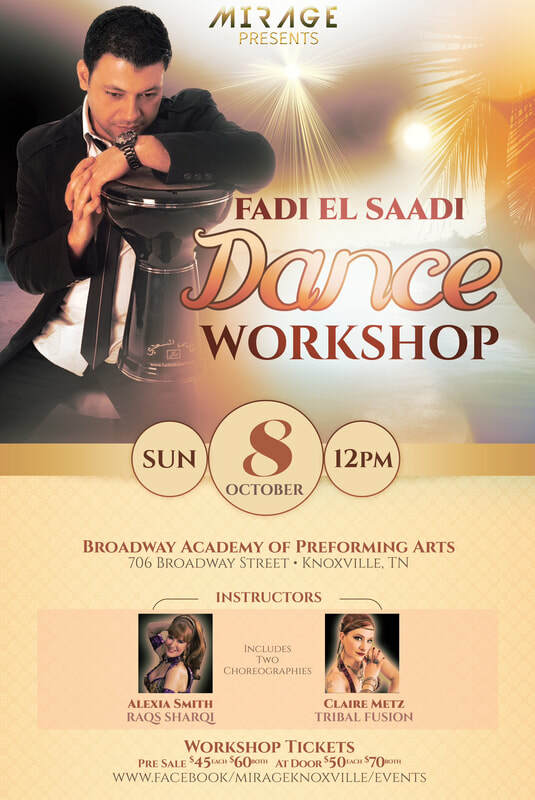 Each instructor will be teaching a unique choreography to Live music from Fadi El Saadi. With two different styles of dance and one of the best Lebanese musicians, this workshop is a MUST!